I was startled this morning to find a hawk in my backyard. It's such an unusual sight that I thought perhaps he was sick or injured. He caught sight of me almost as soon as I saw him. He watched me ("like a hawk!") while I shot a few pictures of him. But when I tried to walk a little closer, he flew away—successfully, so I guess he was OK after all. Wow! That's a beautiful shot! I'm not much of a birder, but this looks like a peregrine falcon to me. Whatever it is, it's a real treat to see such a nice closeup. He or she may have been breakfasting on some little critter in your yard. Lucky you! Thanks, Kay. I hope he didn't eat any of our squirrels! I got two suggestions for the type of hawk, peregrine and Cooper's. 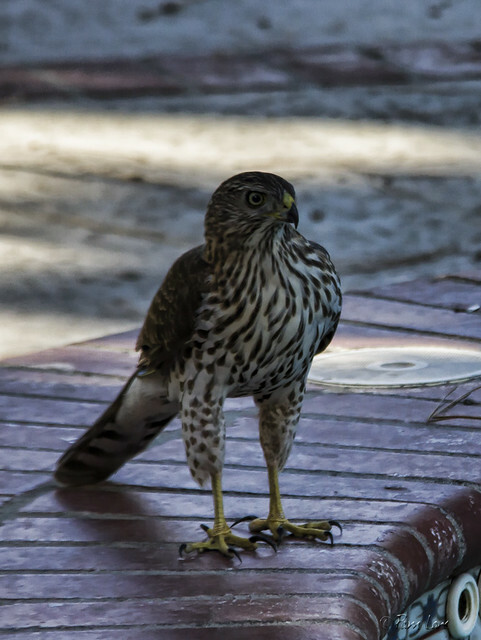 After Googling some images, I think it's a Cooper's hawk -- same front stripes.